Are you ready to try different hairstyles? Are you interested in an entirely new look or just something for a party or special occasion? Do you want to refresh the style you have with a trendy new take? No matter what the reason, there are many ways you can try new hairstyles to find the best one to suit you. Face Shape: Finding the right hairstyle for your face shape will help accentuate your best features without overwhelming your look. Complexion: Matching the color of your eyes, skin, and natural hair color will help you find the right hair color for you without creating a washed out, ruddy, or otherwise unbalanced look. Lifestyle: If you have a hectic, busy lifestyle, easy care hair styles may be best for you, but if you have time for more elaborate styling, you can consider more care-intensive hair styles. Career and School: Many schools and workplaces have grooming guidelines that may cover hair color and hair styles. Before opting for a radical alternative hairstyle, check those guidelines to ensure your new look will be acceptable. Occasion: If you want to try different hairstyles for a special occasion, you need to know what type of occasion to plan for. Soft updos for weddings are gentle and romantic, while prom hair styles may need to be simpler and easier to care for. Hair styles for holiday parties, luaus, costume parties, graduations, job interviews, and homecoming may all be quite different. Once you have decided what new hairstyle will suit you best, you need to find the perfect look. 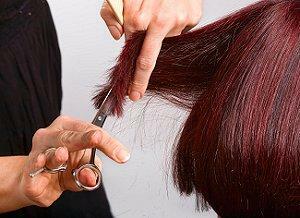 There are several ways you can experiment with finding the best look before cutting a single strand. Consultations: The best way to find your best new look if you are uncertain about change is to consult with a professional stylist. They will be able to offer advice on hair length, color, and styling that can suit your complexion, lifestyle, and personality. Many hair salons offer free consultations. Virtual Styles: If you are tech-savvy, you can give virtual hair styles a try. These websites and programs require you to upload your picture and will digitally manipulate the photo to show what different hair styles would look like. Pictures: The easiest way to find a new look is to browse hair style pictures and collect the photos that appeal to you most. Choose photos where the model has similar hair and skin coloring to you for the best results, and note what you like about each style so you can discuss your new look with your stylist. If you aren't quite ready to experiment with a new hair cut or color, there are several options you can use to rejuvenate your style without drastic measures. Hair Extensions: Hair extensions add instant length to your look and can help you experiment with updo styles or other long hair looks without waiting to grow your hair long. For a quick few inches, consider clip on hair extensions as well. Will you be happy with bobbed hair? Subtle Color: Adding hair highlights or hair lowlights shades can instantly transform your look without making a drastic color change. For a fun and unusual touch, try pink hair or a rich purple hair highlight that will draw attention even if your look doesn't change. Wigs: Many wigs and hairpieces are beautifully made and will fit flawlessly, giving you a great opportunity to change your color, cut, and style instantly. High quality wigs can be expensive, however, and it is best to only purchase a wig if it will be worn frequently. Accessories: The right hair accessories can jazz up any style. Head bands, clips, claws, barrettes, hair pins, and more can be used with formal or casual styles to add sparkle, flair, and color without any style changes needed. Subtle Cut Changes: If you do want to change your style but don't want a radical difference, make a subtle style change. Add a few layers to your look for greater volume and movement, or consider adding bangs to help frame your face and accent your eyes. It can be nerve-wracking to try different hairstyles, but if you know how to choose the best style for you and how to change your look with subtle flair, it can be a fun and fashionable experience.